In Fantage news, the January special item has been released and it is an Agent Costume! When you wear them you do some really cool animations, take a look! Fantage have also released some new clothes and hairstyles this week. Head on over to Le Shop and Stellar Salon to look at them! That’s everything for Fantage but in Peace Police news we now have over 100 members!! 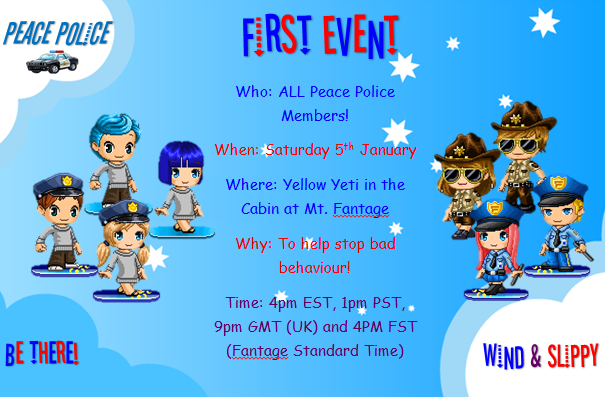 For this reason we are asking all current Peace Police members to attend our first event tomorrow Saturday 5th January on the server Yellow Yeti in the Extreme Snowboarding Cabin at Mt Fantage. The time for this will be 9pm GMT (UK) time. This means 4pm EST and 1pm PST. It is also 4pm FST (Fantage Standard Time) We hope that all members can attend as will start our first mass reporting spree. Re-blog this image and/or tell your Peace Police friends so we can get as many people to come! Make sure to be on our xat to stay connected with all members of the force! UPDATE Thanks to all who could make it, we didn’t run into much trouble and only managed to report a couple of people (Maybe they were scared of us and didn’t say anything xD) The turnout was good but considering we have over 100 members only 15-20 people attended 😦 Still better than nothing but i do urge everyone to come next time. We will decide when this is in our next post.